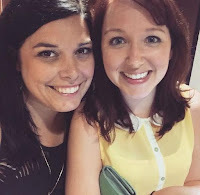 After almost five years of friendship, I finally got to meet Jamie from The Perpetual Page-Turner in person, this past summer. She's become a dear friend of mine, way outside this book community. In fact, our first meeting happened at one of our other friends' wedding! I am so incredibly grateful for this experience, bringing such an amazing woman into my life. She is one in a million, folks. 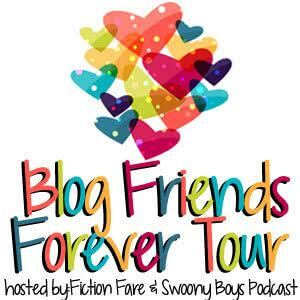 For my stop on the Blog Friends Forever Blog Hop, I thought it would be cool to pick apart Jamie's brain -- ask her some book related, blog-type questions. If you're a newbie, just starting out in the community, I'm hoping this interview will give some insight. Or if you've been around for awhile, like the two of us have, perhaps these questions will prompt you to think about your own experiences. Regardless, hope you have fun getting to know Jamie better and seeing why I love this girl oh so much! What made you decide to start a book blog? Do you remember the very first book you reviewed on the blog? I had gotten back into reading again in 2008 after not reading much as a teen or college student. I joined Goodreads in my final semester of college and got super into the groups there and even started a College Students group. I enjoyed finding people to talk about books with and suddenly I was the voracious reader I used to be again. One of the members of my group, April from Good Books and Good Wine, had a blog and I thought it looked fun and the community looked great (I had always had personal type blogs and Xanga and Myspace) but I didn't think I'd be able to read enough to do it on my own so I put out a call on the College Students group and had about 12 people answer. We started The Broke and the Bookish at the end of June in 2010 and I realized that same week that I wanted my own blog too because I WAS reading enough to do it by myself and I wanted my own space too. So I started The Perpetual Page-Turner as my solo endeavor that same week. The first book I ever reviewed on here was a self-published travelogue that I had won from Goodreads as an ARC. It was about a family who traveled around the world and I really enjoyed it. I would link to it but when I migrated from Blogger to WP a couple years ago I lost the first 2 months of my blog. For some reason they just wouldn't transfer over so I just gave up. Tell me a little about 25 year old Jamie. What was she like when she started The Perpetual Page-Turner? What types of books was she reading? 25 year old Jamie. Hmmm. She was underemployed. She was working super part time for a magazine trying to get just any experience she could. So she had a LOT of time to spend networking and growing her blog which I really did think made all the difference in my growth. It was summertime and the world cup was on so she spent her time blogging and watching the world cup when she wasn't at work. She was still living at home. Was obviously still dating Will. Was looking for full time work. And was still involved in a friend group that made her feel like crap. Still hiding so much of herself so blogging was a godsend because she could be 100% herself unlike with her friends. It was definitely the catalyst for her to stop caring what these friends thought and become her true self. She was mostly reading adult fiction but was slowly getting into YA (thanks Twilight and The Book Thief) but then a couple months into blogging she was reading mostly YA. What has been the most frightening, anxious, stressful experience of book blogging for you? I think most stressful thing is just the every day stress you put on yourself as a blogger until you realize that you need to just calm down because you blog better when you aren't letting it stress you out. At least that's how it was for me. I think my biggest source of anxiousness and stress for me is keeping up with the interaction part of blogging. It's my favorite part but some weeks I don't have any time after I get my posts scheduled and I would feel massive guilt for not reply to all comments or tweets. I want to but I also try to have "off" time from blogging and I have to respect that time or else my whole life could literally be blogging. I get so anxious about it because you see comments about "bloggers who don't respond to comments are rude or don't care" and that couldn't be further from the truth. Sometimes I'm able to be "on" and sometimes I'm not able to. I think it started a couple years ago when I was getting like massive amounts of comments (that is not at all a brag...just a fact of how it was) and I literally couldn't keep up with it. I just couldn't. I was so overwhelmed yet so gracious and excited to connect with people. I could have taken 3 hours just responding and I wanted to be off my blog and showing others loved but I also wanted to respond to those who took the time. I got myself so anxious to try to do all things that I was having panic attacks about even opening up my blog so I just stopped doing anything because I felt like I couldn't win. I'm in a better place now and getting less comments than back then so I'm able to do better but it's still the thing that makes me most anxious about blogging because I really do care and appreciate everything but I also don't want ALL my time to go to blogging. It's never EVER personal or a reflection of anything other than a TIME factor but I stress out so much about what people think when I don't respond to their comment or tweet. I get overwhelmed and I try to push through it because I genuinely have always cared most about interaction and community but I can't say I've been perfect or that it hasn't physically affected me. Thank god for good blogging friends who remind me that you can't do ALL THINGS for ALL PEOPLE. As far as frightening? That time a blogger got stalked by an author. I knew it was an unusual and rare event but it still makes you pause like DAMN this is still the internet...I need to remember that. What has been the most crazy, outrageous, incredible experience of book blogging for you? Well, every BEA experience but my first night of of my first ever BEA in 2011 was INCREDIBLE. Meeting these people who had become friends. I had NEVER really met anyone from online (okay except a boy in a band from Myspace back in the day) and it was just this incredible first meeting because we all just CLICKED like we did online. That first night we ended up dancing on the bar at Coyote Ugly so you know it was a good night. It was funny when I told Will because I think he was like expecting us to like sit around and read in circles or something....which is so something we also all would have done. That was the magic...meeting people who were so much like me as a bookworm: are happy sitting at home in their jams reading but simultaneously so okay with going out dancing and drinking. Also, meeting RL Stine. I mean, he was the man who contributed to the voracious reader I was as a kid. I devoured Goosebumps but honestly his Fear Street novels were pretty much the only books I was reading as a teenager with any sort of consistency. He was so, so incredible nice and down to earth and it was so incredible to have a childhood legend live up to what you had hoped they would be like. I just never thought it would be possible to ever have a chance to meet someone who was a huge part of my childhood and then to be able to do so as an adult was just SURREAL. How often do you get to thank those childhood legends who helped make you into the person you are today?? If you could go back and give the early days of blogging Jamie some advice, what might you tell her? Stop stressing about 98% of the things you are stressing about when it comes to blogging. Life is big and, while blogging is awesome, it is not your whole world so stop treating it as such...plus you aren't getting paid a full time wage sooo. I would have loved to have learned how to be chill about things earlier on. Also, HIRE SOMEONE TO TRANSFER YOUR BLOG FROM BLOGGER TO WORDPRESS (though I would have told her not to start on blogger anyways) and FOR THE LOVE OF GOD DON'T DECIDE TO DO IT AT WORK AND HAVE A FULL ON ANXIETY ATTACK BECAUSE YOU LOST ALL THE FOLLOWERS AND TWO MONTHS OF BLOGGING WORK. I seriously don't know why I thought I could do the switch while I was at work NBD. Where do you see the future of the Perpetual Page-Turner? What are some of your dreams/aspirations for your book blog? You know, I don't really know. The future feels hazy right now. For the moment, I'm just enjoying what a laid back experience this is for me. I'm happy with the content I'm putting out and how often and how I don't think twice about taking a break when I need it. I think I used to have dreams and aspirations for making this a full time or part time gig (because I always though it would be amazing to have your work be something you love) but I'm kind of just happy with it being a hobby these days. I've made some money from blogging and it was nice but I'm not really actively perusing that anymore. So maybe I'm aspirational-less at this point in my blogging career. I feel like I hit all these subconscious milestones I wanted to hit and done things I've wanted to do. I'm happy with what my blog has accomplished and how I feel about it right now. I hit 5 years of blogging here and it's weird to not really have any goals or anything for this blog anymore. I don't know? I don't know what that means. I guess the one thing I still would dream of is to BE BLURBED ON A BOOK OR ARC. That would be neat? The book that's changed your life since discovering book blogging? Just One Day by Gayle Forman. I have a whole post about how it physically changed my life but long story short: it caused me to make some much needed changes in my life that I was too scared to make. I can't think of any other book that catapulted me into a change than that one. Lots of books have changed my life for various reasons but none so distinct as that one. You are given $100 in a bookstore, tell me what ends up in your shopping cart! Then I'd be at $92 and would probably find some books on sale or buy a magazine or two! How has the book blogging community evolved over the years? Any advice you'd give to someone just starting out? It's changed A LOT. This answer could be an essay. I'm not opposed to change because YAY NEW THINGS but sometimes it's hard to reconcile some of the ways it's changed. It's definitely grown bigger and there are all sorts of different mediums -- youtube, instagram etc we are all on now. I think the biggest thing is the way publishing is involved compared to when I first started. Giving ARCs to bloggers and even including bloggers into the marketing plan was so new when I first started and now it's just hand in hand with blogging it seems. Most people were blogging about their own books when I first started and collaborating with publishers was all so new territory that things like blog tours and stuff were new-ish. It's a different community -- more vast and more about having a ~brand~ and ~making it~ when their wasn't this huge rush to do that before but the introduction of ARCs and opportunities with publishers definitely shifted it all through the years. I'm not saying like it's necessarily a bad thing...just a part of how it changed. There are still very homey feeling blogs with personal touches for sure! I feel like I've always tried to keep that no matter how much I work with publishers or if I make any money blogging. My biggest advice is just DO YOU. I know it sounds like DUH. But take a look at what you like and what you don't and no matter where the community is trending just do what will make you want to return back to your blog consistently. Don't make something that isn't ACTUALLY important to you important just because you feel like you have to. I've done that. It's miserable. I love my blog all these years because I stopped doing things I didn't want to/wasn't feeling/didn't like and did the things that brought me joy. I changed where I needed to change if something no longer brought me good feelings. And in DOING YOU, remember that this blog IS NOT the whole YOU. It's easy to get caught up in making your blog the end all be all of your life and you put lots of stock into it. When that happens? Every little thing -- a decline in traffic, not getting picked for a cool opportunity, somebody not replying back to you, not getting a book -- will feel WAY more important than it really is in the grand scheme of love. DO YOU and have the blog YOU would want to read. Your blog should be something that adds to your life and not detracts. If it starts to make you feel bad or not bring you joy, figure out why. Change it. Okay I'm KIND OF CHEATING. But every time I got to meet one of my blogging besties in real life. Those individual moments are just rolled into one BEST moment. YOU WERE THE FINAL ONE I HAD NOT MET YET AND OBVIOUSLY IT WAS AMAZING. That's what it's been all about for me when I look back over the past 5 years -- no book or blogging accomplishment or opportunity has meant more to me. I'm offering up not one, but two, giveaways on the blog! Be sure to enter my personal giveaway below for a chance to win Just One Day by Gayle Forman (a book that both Jamie and I love and have discussed in length!). Then be sure to enter the #BFFBlogHop Giveaway below: 3 winners will be chosen to win 1) $75 gift card, 2) $50 gift card, or 3) $25 gift card -- all to winner's choice of book retailer. GOOD LUCK!!! Thank you so much for taking part in the hop! We're so glad you had the time to participate! And what a great interview! I met my best friend Ani on the first day of 6th grade, because one of her friends was in my homeroom and we were the only two girls, so we instantly bonded (which led me to follow Lauren over to Ani's homeroom). We've been best friends for 12 years! I'd share "Since You've Been Gone" by: Morgan Matson, with her because it eerily reminds me of our friendship. I met my best friend in person briefly then we reconnected on Twitter. I met my best friend in 2nd grade because we had identical book bags. We've been besties ever since. Thank you so much for this hop. It's a special one. P.S. I can't get my friend to read a book (we might have to stop being friends because of that) - Just Kidding. My HS BFF and I met because she was reading and I went over to discuss the book with her. I don't remember what that book was but we have shared many fave books since. Oh my gosh, I didn't know that was how The Broke and The Bookish was formed, that is so cool. Oh no for lost months. :( That's sad because it's the beginning. The stress remarks are so on point, it's better to blog when you're not stressed out. The author stalking the blogger was beyond creepy. I think being blurbed on a book or ARC would be so amazing. You've inspired me to read Just One Day now, I love books that make me want to re-evaluate and change my life. I love your book choices! I need to read Uprooted, I'll Give You The Sun and Harry Potter. I met my best friend through work about 15 years ago. She loves to read biographies so I'd find one of interest to us both. I met one of my best friends in school about 14 years ago. We weren´t the best of friends then. She was new and my old friends didn´t like her. But she is the sweetest person I know, and although we didn´t were so close then, we came to be. Burn for Burn is a book we both love!